One of the complaints being voiced over at Dragonsfoot these days is that the old “price list” for adventuring equipment, weapons and armor used in Dungeons & Dragons is unrealistic. The first version of D&D I ever played (1978 edition) had very simple rules for generating a character — after rolling the dice to determine your character’s abilities and picking a class (magic user, cleric, fighter or thief, elf, dwarf or hobbit), you rolled dice to randomly determine how much ‘starting gold’ you had and then bought what you wanted or thought you needed from a price list that had everything from chain mail armor, axes, bows, spears, etc., to more mundane items like backpacks, ropes, torches and lanterns. The departure from economic reality in classic D&D does not bother me much. If you ‘fixed’ prices in the price list to become more realistic, you would also have to ‘fix’ treasures to reflect the idea that big piles of coin just might not be availible. OK, so you toss out the treasure tables in order to get a more realistic price on lamp oil and torches… what other changes would you have to make for ‘realism’? And, once you got done making all of those changes, would the game even be fun anymore? I wonder if, strictly speaking, the ‘price lists’ of games like D&D, where every ‘dungeoneering item’ like torches or rope has a fixed price, might be pretty ahistorical anyway. In a typical medieval town would one have found little bodegas that sold everything from flasks of oil to spikes, sacks and 10 foot poles? Would there be a lot of ‘readymade’ goods available? Would the armorer really have a rack full of suits of armor ready to wear like they have ready to wear suits for sale at The Men’s Wearhouse? Would a lamp oil merchant really sell oil in little ceramic flasks, ready for dungeoneering, or would the vast majority of his customers provide their own container and the merchant would just sell the oil itself? The latter seems more likely and I don’t think “variety stores” (like 7-11 or Sears Roebuck) are likely in preindustrial times. The people who sold shoes probably also made them. There would be merchants who carried goods from one town to another, but I think they would make money on the fact that prices varied from place to place — you could take wine from the town with the vineyards (where wine was cheap) and sell it for more once you had moved it to a town with fewer or no vineyards. If the oil is made from something like fish, wouldn’t it cost more the further inland you went? Wouldn’t the price of bread go up if the grain harvest was bad? Moving goods by cart or mule would add a lot more per unit cost than moving them by UPS or Fed Ex. If I’m not mistaken, Europeans had to come to the new world to discover platinum, so if you are, strictly speaking, basing your economy on medieval Europe, then platinum coins should go. I don’t know if the American natives used platinum at all as a metal, or even if they knew how to extract it from ore…(OK, I just Wikipedia’d it… and, according to Wikipedia, the first mention of Platinum by a European was in 1557…). Although the pre-Columbians had silver, gold and copper, I don’t think they used them as a medium of exchange the way the Spanish did, anyway, so different cultures might value different stuff. 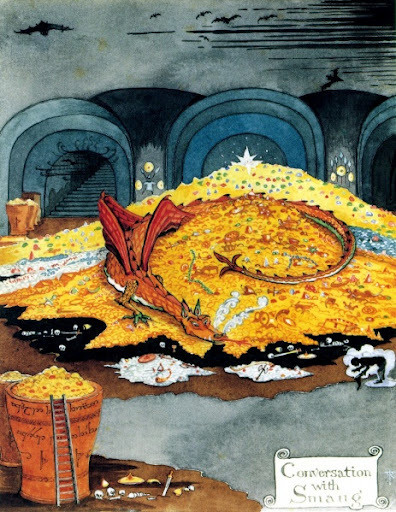 Plus the idea of a ‘universal’ economy where gold coins, silver coins, copper coins, etc., are all valued the same and items like gems have a fixed value seems pretty unrealistic, but if you want to give PCs XP based on treasure, you need to standardize value of ‘prizes’ at some point. I suspect that fixed prices in the marketplace may actually be a relatively recent phenomenon. In older economies, people probably tended to haggle or bargain a great deal more… but to be honest, in most cases when I am gaming I really don’t anticipate roleplaying the “haggling” between a merchant and a player character whenever the players need a coil of rope or a few candles. In a quasi-medieval setting, it seems entirely likely to me that someone who bought oil from the oil merchant every week or month might be charged one price while some stranger who came into town and was probably heading off somewhere to get killed by trolls and never return was going to be seen as an opportunity to make a little more. The regular customer from next door is the oil merchant’s bread and butter. The adventurer who needs lamp oil might be seen as ‘gravy’ money. Faced with the sheer record keeping nightmare that a realistic pricing structure entails, I think I’ll stick with a price list — although a nod to realism (such as perhaps variations in price or potential shortages) could add some fun. A food shortage could be a great adventure hook. But at the end of the day, the price list is just one way to get coin out of the pockets and pouches of the player characters. My own experience is that in ‘default’ D&D, carrying all the stuff one might want to have on an adventure rather than being able to afford it is usually more of a problem for player characters. After a few adventures, my 2nd or 3rd level fighter is likely to be able to afford several suits of platemail at 50 gp a pop… so if a black pudding dissolves his armor he is likely to be able to afford another suit — but given the bulk and weight, he is unlikely to have it with him!